The Robert Wood Johnson Foundation (RWJF) last month announced that Naa Oyo Kwate, associate professor of Human Ecology at the Rutgers School of Environmental and Biological Sciences and Africana Studies at the Rutgers School of Arts and Sciences, was named a winner of the Young Leader Awards: Recognizing Leadership for a Healthier America. Ten individuals, who are leaders 40 years of age and younger, were selected because they offer great promise for leading the way to improved health and health care for all Americans. Each winner received an individual award of $40,000. Kwate was honored for her creative and innovative research on the social determinants of African American health. 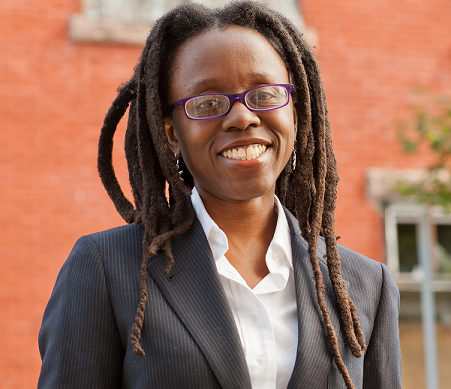 Her work investigates race-related stressors and resource inequalities for African Americans in urban contexts, particularly New York City. Using research methodologies ranging from one-on-one surveys to Geographic Information Systems, her work has revealed the subtle and persistent ways racial inequality affects health risk. In a 2009 study, Kwate published the first empirical research to show that exposure to outdoor advertising of alcoholic beverages was associated with the probability of problem drinking among African American women. She is currently conducting a study of the effects of multiple levels of racism on African American health. Her research has been supported by the Department of Defense, the Robert Wood Johnson Foundation, and the National Institutes of Health. For 40 years the Robert Wood Johnson Foundation has been dedicated to helping Americans lead healthier lives and get the care they need. As one way to mark their 40th anniversary, RWJF established the Young Leader Awards: Recognizing Leadership for a Healthier America. As we reflected on our accomplishments over the past 40 years, we also wanted to look to the future, said RWJF President and CEO Risa Lavizzo-Mourey, MD. During the relatively short period that our foundation has been operational, these impressive men and women were born and raised and started doing amazing things that can potentially improve the health of all Americans. We’re proud to acknowledge their early success, and inspired by the potential they have to improve U.S. health and health care, she added.